I am trying to get an information from the web (adress in my code) with HtmlAgilityPack in C#, but I have to wait until the <div class="center fs22 green lh32"> is loaded on the page. ThreadStateException: Can not instantiate ActiveX control '8856f961-340a-11d0-a96b-00c04fd705a2', because the current thread is not a partitioned thread (STA, Single-Threaded Apartment). 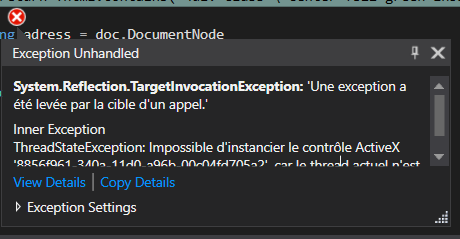 How can I get rid of this error ? Not the answer you're looking for? Browse other questions tagged c# html-agility-pack or ask your own question. Calling another form with WebBrowser from mainform - giving ERROR?